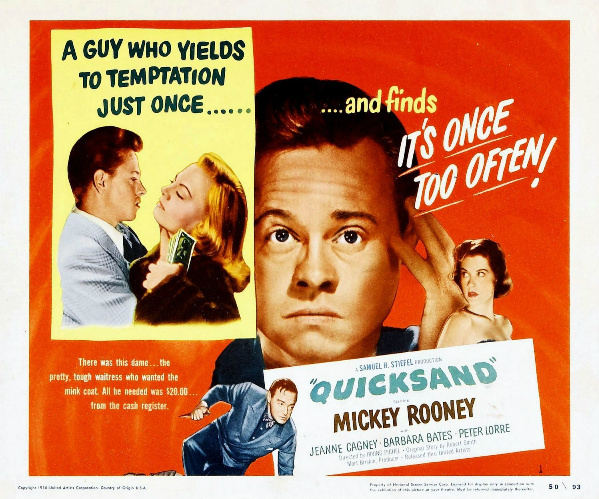 Quicksand refers to the impressively pathetic hole that Danny Brady (Mickey Rooney) digs for himself throughout this fatalistic workingman’s noir. What starts as “borrowing” $20 from the till at the garage where he works turns into grand larceny and murder. The film’s message damning greed is steeped in gritty atmosphere provided by Long Beach’s waterfront amusement park, The Pike. As Danny sinks further into the clutches of fate, he learns the hard way that stealing money from the till is just the tip of the corruption iceberg.